I love the way they do bonus promotions at Jackpot Capital Casino. They throw piles of money into the prize pool and structure their promos so that everyone has a chance to win, not just high rollers. This week, they've started a A $225,000 Casino Race that will see $30,000 in prizes awarded every week until February 17th. The race to various destinations on The Strip in Las Vegas is inspired by the popular TV reality show The Amazing Race. Contestants are visiting a wedding chapel, singing with Elvis and of course playing at the casino. Anyone can win but top ranking players are eligible for the biggest prizes. When you play atJackpot Capital Casino you'll automatically earn points when you play and you'll be listed by your points ranking on a Scoreboard. Every Monday the top 250 players receive a bonus based on their rank – up to $800 each. But you don’t have to be at the very top of the Scoreboard to win. There are also Station Prizes for players at each of the six contest levels. Three players that reach the final station will receive a $1000 cash bonus. 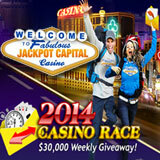 Full contest details and current Scoreboard standings are available at http://promotions.jackpotcapital.eu/2014casinorace. If you prefer to play casino games on your iPhone or iPad go to m.jackpotcapital.eu in the browser on your smartphone or tablet and you'll find ten of the top mobile casino games.